Office Hours: Mondays, 1:00-2:00 p.m. Please contact Drew for information pertaining to the msuscma.com wesbite, member registration, GMM/event sign-in, Most-Involved Members, calendar of events, resume critiques, subscription to MSUSCMA e-mails, and any other general membership questions. Hi everyone! 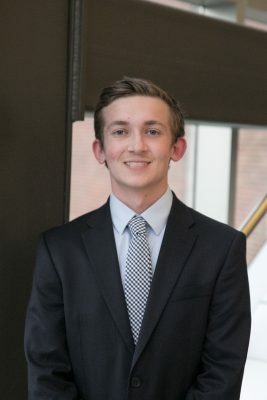 My name is Drew Knox and I am a senior majoring in Supply Chain Management and minoring in Actuarial Science. This is my second year on the executive board and I am excited to work as a Internal Relations Director in the upcoming year. Prior to this role I worked as the Career Fair Director for the 2018 SCMA Career Fair. In 2014 I was employed by Rigaku Innovative Technologies as a Procurement Intern where I assisted the purchasing department and worked closely with the company’s engineers to assess the utility of obsolete and slow moving inventory. Last summer I worked for Lockheed Martin in Orlando, Florida as a Procurement Intern in the Missiles and Fire Control Division. In the summer of 2018 I am interning at Cisco Systems in San Jose, California. Over the past two years, SCMA has not only provided me with a number of resources to further me in my professional career but has given me the opportunity to meet and befriend some of the best students MSU has to offer. I am looking forward to meeting everyone in the coming year and please do not hesitate reach out to me for assistance, Supply Chain related or otherwise!